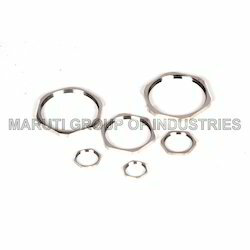 We are the leading manufacturer, supplier and exporter of Lock Nut. Our product range is in sync with industry standards, and it can be availed from us at market leading prices. We are widely appreciated in the market for manufacturing, supplying and exporting a wide array of Lock Nut. The range offered by us is manufactured incorporating advanced technology and machines that are installed at our sprawling manufacturing plant. In addition to this, our logistics personnel make sure to timely deliver the consignments to the clients' end within promised time-frame. Looking for Lock Nut ?